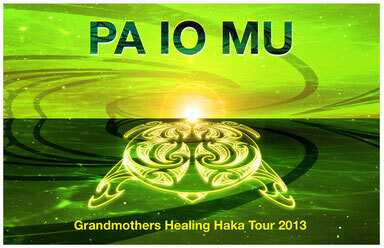 À la recherche de MU - PA IO MU based on the Grandmothers Healing Haka Tour 2013 with Ojasvin and Iris, realized by Martine Cros and Yann le Flochmoen. I arrived in New Zealand on the 30th of January, completely jet-lagged and unprepared, with no expectation cause I didn’t have the time to have any. My life in France was quite full on. I knew this Maori immersion was the best way to start my three months journey in this unknown country for me. First of all, I learned and felt that I was not in New Zealand, but in Aotearoa, the land of the long white cloud. 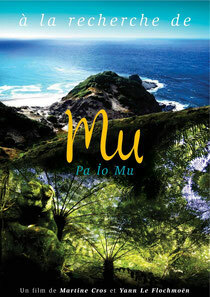 The land of Maori, the land of Waitaha. From this moment on, every step I made, I felt I was on a sacred land. Ceremony and rituals introduce you to every event, big or small. Now, every meal, meeting, healing, encounter with a new family, a new place, is honored and then becomes sacred. We were welcomed by Ojasvin and Iris and their friend Te Nagko o te Rangi (a huge magnificent tattooed Maori) to Aotearoa. It was our first powhiri (say ‘pofiri’), welcoming ceremony, at Maunga Kiekie - One Tree Hill in Auckland. It was so powerful that your heart felt deeply touched, and suddenly your body felt very grounded and connected to the land. Then we were brought to Rongo, a sacred standing stone where we performed a ritual. Then Te Ngako o te Rangi welcomed us to a Whare (meeting house on a Marae, Maori domain), the whare his grandfather carved, in a museum in Auckland!!! This was surreal for me. Right on the first day your mind had to shift. We entered this National Museum in the shape of a V like an Albatros, and we met the ancestors carved on the sacred red pillars inside, by doing the Hongi(nose and forehead in contact), singing and dancing a haka!!! No surprise tourists took pictures, but huge surprise the staff let us do all that even if this whare once belonged to Te Ngakooterangi’s ancerstors. And this was only day one! We then met a master carver, Kerry Strongman. Magical, and huge sculptures in very old kauri wood, native tree. He also carved small ponamu, the sacred green stone from the South Island. It led us to one of the most famous kauri trees: Tane Mahuta, The Lord of the Forest, aged 2000 year old. I could not sing nor say a word like the others to honor him. I remained in a humble silence. We stayed on our first Marae: Kokohui Marae in Hokianga, and we slept altogether in the Whare. We were beginning to become a whanau, a family. Between the special encounters, we learnt songs, haka and shared in circles. One of the haka was in creation and it was great to experience the process. Our next stunning steps waiting for us in the far north were a powhiri under the rain in the sand dunes with Pineaha Murray and the Cape Reinga in the mist. We had the privilege to receive the authorization to step on this very sacred part of the land. This place, where the Pacific ocean meets the Tasman sea, is a door to the heavens. When it’s time for a soul to go in another realm, they all come here to leave the earth. It was almost incredible, we couldn’t see anything because of the thick mist. After the ceremony to the four directions and the four elements, we saw a ray of sun shine through the mist that allowed us to see a beautiful shape of water. It was magical! Day five was off in a lovely hotel with swimming pool and spa, I enjoyed it greatly! We woke up the next day when it was still dark for the Dawn Ceremony of Waitangi Day. We were lucky enough to get into the whare with the prime minister and all Important political and spiritual leaders. It was a great lesson for me, coming from a both French and British lineage, to see how everyone was celebrating the signature of the treaty of Waitangi between the British crown and the Maori that took place in 1840. Rather than stay in useless anger, they chose to lift the spirits to make peace and communicate to create a new balance. The next day we contributed to the big healing, by continuing to heal ourselves. We all received a mirimiri (healing massage) by the generous and very strong Atarangi Muru and her dearest husband Bill. In the mean time we were preparing our dinner all day : the Hangi. A sacred way to cook the food in the ground with hot strones. It was absolutely delicious. After the food from the earth, we went fishing mussels and oysters in the ocean. We connected ourselves to the ancestors of this particular land of Ngunguru, Ojasvin’s family land, by hugging the trees. What a beautiful and deep experience. It was almost the end of our journey and we had a good transition when we arrived in Auckland for the eco festival ‘Voices of the sacred earth’ in Kawai Purapura, a beautiful retreat center. We sang and performed haka before heading to our last night together, in a Marae in Auckland. Thank you so much dear Iris ans Ojasvin, you very hard work is worth it!